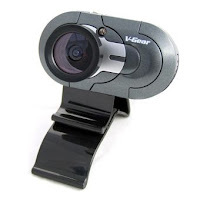 Move about as you sit at your PC and the V-gear Talkcam Tracer Webcam will auto focus and zoom to keep you looking pin point sharp on your screen. Its no joke, as you move so will the webcam. The webcam will take images at 1.3 mega pixels and process up to 30 frames per second (that’s a lot of frames) and also recognises up to 16.7 million different colours for clear and accurate image regeneration. If you don’t want to stream video you can also use the webcam as a camera. Images and video can be focused from as close as 4.3mm and as far away as you like without any glare. By using some nifty V-gear Bee software you can monitor your pets at home remotely or even set the system to monitor for motion and record / sound an alarm if it detects anything.